Are you a friend or enemy? The New Testament speaks about two kinds of people; those who are saved by the blood of Jesus, and the lost, condemned to hell. Scripture makes no apology for the absence of a middle ground: you are either in (the kingdom of heaven), or you are not. 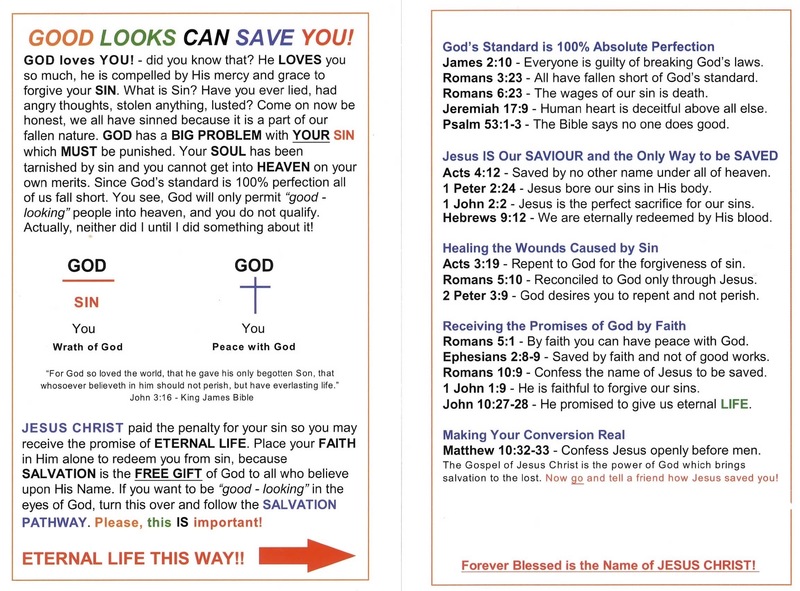 Romans 3:23 says, “For all have sinned and fall short of the glory of God”, meaning every human being is a condemned sinner in the eyes of a Holy and perfect God. From the moment of our conception in the womb, each of us is “out”; unworthy to enter into the Kingdom of Heaven. Humans have an inherent, fallen nature, going all the way back to Creation, and the original sin of Adam and Eve. Continuing in Romans 8:5-8, we read, “For those who live according to the flesh set their minds on the things of the flesh, but those who live according to the Spirit set their minds on the things of the Spirit. For to set the mind on the flesh is death, but to set the mind on the Spirit is life and peace. For the mind that is set on the flesh is hostile to God, for it does not submit to God’s law; indeed, it cannot. Those who are in the flesh cannot please God.” ESV. The King James Version translates Verse 7 as, “Because the carnal mind is enmity (lit. ‘enemy’) against God: for it is not subject the law of God, neither indeed can be.” The Apostle James, says, “…whosoever therefore will be a friend of the world is the enemy of God.” (James 4:4). So there you have it; are you a friend or enemy of Jesus? God loves YOU so much that He sent His only begotten Son, Jesus Christ, to die upon the cross at Calvary for YOUR sins. The bible plainly states all men have sinned, and without a Saviour, we are condemned to destruction and death. What will YOU do? Will respond the call of Jesus for YOU? “And he showed me a pure river of water of life, clear as crystal, proceeding out of the throne of God and of the Lamb. In the midst of the street of it, and on either side of the river, was there the tree of life, which bare twelve manner of fruits, and yielded her fruit every month: and the leaves of the tree were for the healing of the nations. Life. A loving gift from our caring Father. Something that cannot be created by science. Evolution? Not a chance. Darwin or God? Where is Darwin now? Our true Creator the Living God, is alive and orchestrating universe-wide events from His throne in heaven. God designed marriage to be the exclusive providence of a man and a woman for the purpose of procreation. Why? Because at some point in the near future, the LORD will bring about final end-time events to usher in His eternal kingdom upon earth. Abortion? Murder, plain and simple. The “leaders” of our country have no problem legalizing abortion, not caring for the perspective of our Father in heaven. Allow me to make a very clear warning – Abortion is murder. God condemns murder and will hold people responsible for their actions. Our world is cursed because of our collective disobedience to God and His laws. Make no mistake, every action or inaction by every human being is recorded by God for playback on Judgment Day. If you have had an abortion or a part in this industry (yes, it is a money-making business), you can repent and have your sins forgiven! It is never too late – God is waiting for you to ask His forgiveness, confess your sins and start a new life in Jesus Christ. I am absolutely certain God will restore to life every aborted fetus or infant in the soon-coming Kingdom of God. Jesus Christ died for your sins, regardless of how awful wicked they may be. Through His blood upon the cross we can receive the ultimate forgiveness! Please, embrace life, present and future, accept His free offer of salvation now while there is time. Do not wait, do not delay, for if you die without Jesus, all hope is lost. Make a change in your life and do the right thing, now – please. “And the LORD God caused a deep sleep to fall upon Adam, and he slept: and he took one of his ribs, and closed up the flesh instead thereof; And the rib, which the LORD God had taken from man, made he a woman, and brought her unto the man. And Adam said, This is now bone of my bones, a flesh of my flesh: she shall be called Woman, because she was taken out of Man. Therefore shall a man leave his father and his mother, and shall cleave unto his wife: and they shall be one flesh. And they were both naked, the man and his wife, and were not ashamed.” Scripture succinctly defines marriage as between man and woman, the purpose of which is to produce offspring which may inherit eternal life and the Kingdom of God. “I will praise thee, for I am fearfully and wonderfully made: marvellous are thy works; and that my soul knoweth right well. My substance was not hid from thee, when I was made in secret, and curiously wrought in the lowest parts of the earth. Thine eyes did see my substance, yet being unperfect; and in thy book all my members were written, which in continuance were fashioned, when as yet there was none of them.” Human beings are perfectly created in the image of God. Can anyone declare how a baby is formed? Is science able to duplicate the infinite complexity of new life? No. Only God is able to create life, which He alone is able to give. “And he will love thee, and bless thee, and multiply thee: he will also bless the fruit of thy womb, and the fruit of thy land, thy corn, and thy wine, and thine oil, the increase of thy kine, and the flocks of thy sheep, in the land which he sware unto thy fathers to give thee.” Blessings of offspring, crops and other increases are promised to those who are obedient to the LORD. “I was cast upon thee from the womb: thou art my God from my mother’s belly. ~ The wicked are estranged from the womb: they go astray as soon as they be born, speaking lies. ~ By thee have I been holden up from the womb: thou art he that took me out of my mother’s bowels: my praise shall be continually of thee.” Both the righteous and wicked enter the world from our mother’s womb. We should continually, day by day praise the LORD for giving us life. “Lo, children are an heritage of the LORD: and the fruit of the womb is his reward.” Children are born to men and woman such that the Kingdom of God might receive them into glorious eternal life. All life is given by God, and what He gives may be taken away. Life is precious and should never be taken for granted, for it is a miracle of God. *The word “charity” is used in the King James Version to represent pure love, the kind of love God has for us, a love that is faithful, true and honest. Charitable love does not tremble in times of trials, it is perfect and unending. Although I have only used a small number of scriptures in this short study, the entire bible conveys the story of how much God love us, in addition to how we are to interact with one another. In 1st Corinthians 13, Paul explains that unless the Christian has charity (love and compassion) for our neighbours, we have nothing. Jesus said we are to forgive those who have transgressed against us, freely, lovingly, and without hesitation. It is essential for us to remember that God loves us, so much so He allowed Jesus Christ to die upon the cross for our sins – a perfect declaration of love! Therefore, it is perfectly clear, and also confirmed by Jesus, that the Father will not forgive our sin unless we forgive those who have wronged us. My hope and prayer for all of us is to be more loving, forgiving one to another, and not giving occasion for the devil to stir up evil within our hearts. In the beginning, God created the heavens and the earth. At the centre of God’s creation, He formed Adam and Eve from the dust of the earth, and commanded they be fruitful and multiply upon the face of all the earth. Taking advantage of the free choice God gave them, Adam and Eve chose to disobey by eating of the forbidden tree. As a result of this seemingly innocent event, all mankind was condemned to suffer the cancerous effects and sin. So instead of living with God in a perfect environment, they were cast out of the Garden of Eden to fend for themselves. During the following centuries, a story unfolds of how the descendants of Adam and Eve grew into great and mighty nations and kingdoms. The many stories weaved like a thread through the bible are part of the redemptive story of God for mankind. Throughout scripture, we learn how God works with us to conform our hearts, minds and actions to His will, forgiving our transgressions and having mercy upon us. We are also clearly shown how God deals with sin, disobedience and all who chose to do evil. Just as God gave Adam and Eve the free choice of whether or not to obey Him, so are each one of us given free choice as well. Each human being has the freedom to follow either God or Satan, one leading to eternal life and joy, the other to death and destruction. [Jesus is the only way] In John 14:6 we read, “I am the way, the truth, and the life: no man cometh unto the Father, but by me”. Clearly, it is not possible for man to come to the Father without Jesus Christ, His Son and our Saviour. The central theme in God’s plan of forgiveness and redemption, is for us to live with Him in a renewed and perfect earth. The bible says all men are sinners and wholly incapable of cleansing themselves of sin without a Saviour. [All have gone astray] Isaiah 53:6 “All we like sheep have gone astray; we have turned every one to his own way; and the LORD hath laid on him the iniquity of us all.” [We are justified by grace] Romans 3:23-24 “For all have sinned and come short of the glory of God; Being justified freely by his grace through the redemption that is in Jesus Christ.” [The wages of sin] Romans 6:23 “For the wages of sin is death; but the gift of God is eternal life through Jesus Christ our Lord.” The bible tells a story, our story, of our struggle with sin and how helpless we are before the Almighty God. How the story ends is personal to each one of us and how we respond to God’s word. If we choose to follow our own lusts, willingly living in the sins and evil of this world, then we are destined to the Lake of Fire. However, choosing to accept Jesus’ free offer of salvation, we may be granted eternal life and live with the Father and Son forever and ever. How will you choose? “This know also, that in the last days perilous times shall come. For me shall be lovers of their own selves, covetous, boasters, proud, blasphemers, disobedient to parents, unthankful, unholy. Without natural affection, trucebreakers, false accusers, incontinent, fierce, despisers of those that are good, Traitors, heady, high minded, lovers of pleasures more than lovers of God; Having a form of godliness, but denying the power thereof: from such turn away.